•	A sign-up sheet is going around the room to sign up for a shift in the Kiwanis booth at Bike Week. •	The RVYSEF golf scramble is being held Saturday, June 28th, at Pheasant Ridge Country Club. •	Our next meeting is June 23rd. There will be no guest speaker, as the meeting will be followed by a Home Run Derby committee meeting. All members are invited to attend. Brian Winslow briefed the members regarding procedures to man the Bike Week Kiwanis booth where we will be selling water and Pepsi products this year. Parking for Kiwanis workers will be available at Thurston’s Marina. Brian will be dropping off drinks each morning. He will also have a laminated sheet of instructions at the booth. Those instructions are also available by “clicking” here. "Charlie, I've got your number." $60 was collected for the Food Pantry. 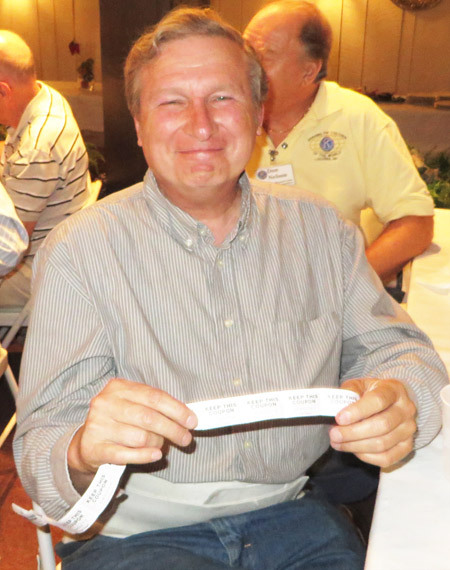 Joe Adrignola won the free meal. $1 from Scott Laurent for being able to participate this past Saturday in a motorcycle ride and BBQ in memory of Devin Denoncourt, son of long time member Dennis Denoncourt. Steve Loughlin introduced our guest speaker Charlie St. Clair, Executive Director of Motorcycle Week. 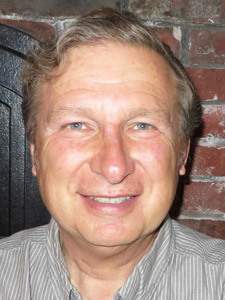 Charlie has been associated with the annual event since 1991. In addition to Motorcycle Week celebrating its 91st year, Charlie reported plans are already underway for the grand celebration of the 100th Motorcycle Week in 2023. Shirts are presently being sold with a specific logo on them announcing that event. Charlie noted just how competitive it is to get attendees to Bike Week citing the fact there are over 600 motorcycle events throughout the country competing for the same riders. Charlie also noted that any event held during Motorcycle Week is a moneymaker. However, for the 3rd consecutive year, there will be no hill-climb competition at Gunstock. In 2004 there were 10,000 paying spectators for that event. This year, there will be a burn-out event at the Loudon race track. Charlie concluded his presentation by saying the Laconia police department has been terrific in all the years he has been involved. For more information on Motorcycle Week, “click” here. 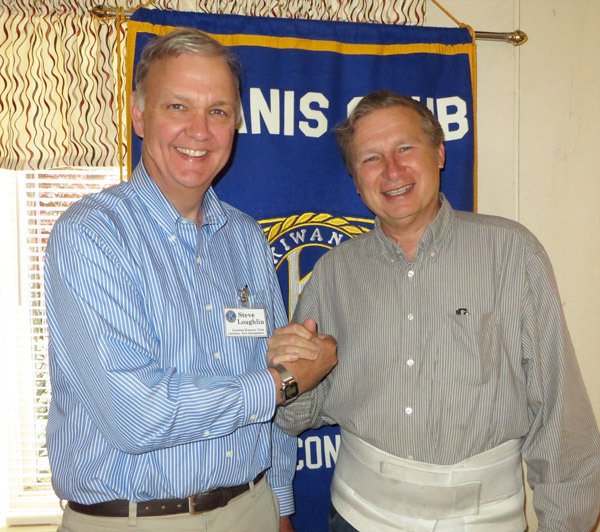 Steve Loughlin gets the offical "Motorcycle Week" handshake from Charlie St.Clair. 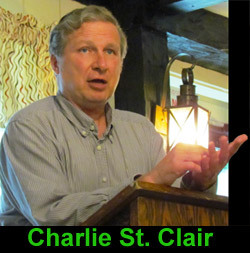 a picture she took of Charlie St. Clair during his presentation. 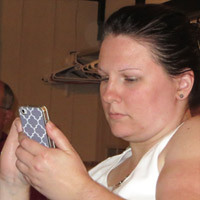 To view Meredith’s contribution to Laconia Kiwanis Club on facebook "click” here. 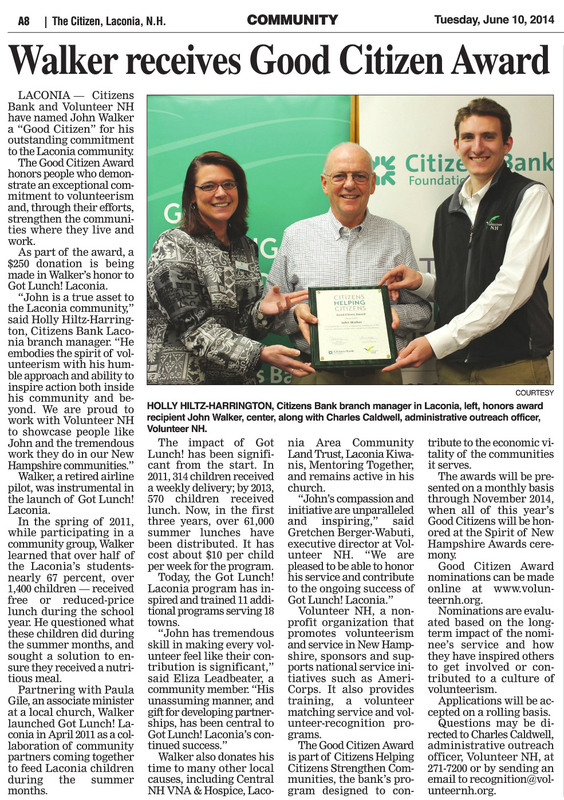 Tonight's meeting was adjourned at 7:42 p.m.
Congratulations to John Walker who was featured in The Citizen for recently receiving the Laconia Good Citizen Award. 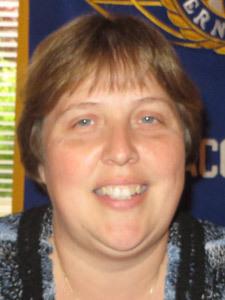 You can read the story that appeared in The Citizen of June 10, 2014 by "clicking" here.